OSC is continually working with our supply partners to secure technologies that will optimize plant health and provide consistent playing surfaces. We are pleased to offer a professional line of turf fertilizers from Nutrite as well as a high quality line of foliar applied fertilizers from Foliar Pak. Our sales reps work with you to develop nutrition programs for all Ontario growing climates and soil types. From granular applications to spoon feeding to pre-stress conditioning, OSC has quality nutrition products to help achieve your goals. View the 2019 Foliar Pak Product Guide - Click here for more information. 26-0-0 N-Durance is an economical, multiple slow release formulated liquid fertilizer designed for foliar applications on turf. 18-3-4 Zeta Plex provides safe, reliable nutrients enhanced with patented amino technology and our plant derived L-amino acid package. These bioactive ingredients increase nutrient absorption and maximize plant nutrition through the use of low dose applications. Foliar-Pak 14-2-4 provides reliable nutrition and controlled turfgrass growth under any environmental condition. Foliar-Pak 14-2-4 is a high-performance foliar fertilizer containing iron, manganese, and our proprietary L-amino acid package which increases nitrogen fixation, chlorophyll production, and the production of anti-stress compounds. Foliar-Pak Bio 12-6-6 provides bioactive ingredients which improve microbial activity and nutrient availability while reducing fertilizer inputs into the environment. Foliar-Pak Bio 12-6-6 promotes rapid root growth and speeds recovery of damaged or stressed turf. Foliar-Pak Grow-In takes the guess work out of building a program for turfgrass establishment. Combines the foliar nutrients most necessary for rapid turfgrass establishment into one jug. Delivers a comprehensive array of beneficial components that charge the plant and the soil. Expedites maturity, density and hardiness of the turfgrass stand. Enhances root development. Made for establishment of all turfgrass species. Foliar-Pak Boron is a highly concentrated liquid boron product formulated by reacting boric acid with a specific amino acid to deliver a new boronamino acid complex. This complex increases the boron solubility, helping it move into the plant more effectively. The amino acid itself metabolizes into important structures that improve plant performance. Foliar-Pak Boron provides health responses not offered from other Boron fertilizers. Foliar-Pak Amperage is a liquid blend of iron, manganese and zinc in an organic nitrogen matrix. Foliar-Pak Amperage is formulated with a blend of gluconic sugars that hold the metallic ions in solution allowing the plant to assimilate the nutrients as they are required. Foliar-Pak Amperage is great for maintaining base levels of the primary minerals required for complete photosynthesis especially during periods of cool temperatures. Foliar-Pak Promote is a powerful combination of highly concentrated sea plant extracts, humates, and wetting agents, along with key nutrients to enhance the plant’s ability to fight stress and maintain proper metabolic functions. Foliar-Pak Promote can be used effectively as a fertilizer for turf, ornamentals, and trees. Uses include foliar applications, soil drenches, and deep root feeding. Zeta Plex Iron is a brand new, unique combination of iron and manganese that is protected by three different natural and modified plant metabolites. The low-molecular-weight plant metabolites allow for movement through the stomatal pores and trans-cuticular pores; the high-molecular-weight modified plant metabolite chelates the iron and manganese for secondary uptake via the soil. This engineered redundancy ensures rapid uptake for the turf in all growing conditions. Foliar-Pak Armament P protects nutrients from adverse interactions in the soil while increasing phosphorus uptake and efficiency by as much as 30%. Foliar-Pak Armament P is a premium phosphorus supplement for highly maintained turfgrass. It is formulated with long chain carbon technology specifically designed to deliver phosphorus to plant roots. Foliar-Pak Magnesium increases magnesium content in plants. Protected by a 2:1 ratio of amino acids to magnesium, the magnesium is fully chelated by amino acids. Complete chelation of the magnesium ion maximizes the solubility of the complex, and the protection given to magnesium, which increases foliar entry into plants, while also ensuring a more efficient movement through the vascular system. Engineered and natural biological enhancers work in synergy to increase soil microbial activity, maximize root structure, and optimize nutrient uptake. Armament Bio is a powerful combination of plant and soil enhancers designed to produce more vigorous, resilient plants that are able to defend against disease, insects, environmental stresses and heavy traffic. Foliar-Pak 1-0-15 delivers vital potassium to the plant, enhancing the ability to combat stress and disease. Safe, reliable nutrients enhanced with our plant-derived L-amino acid package. Foliar-Pak 1-0-15 works to increase nutrient absorption and maximize plant nutrition through the use of low dose applications. These L-amino acids work in various pathways to increase nutrient uptake, nutrient transport, and improve plant tolerance of environmental stress. Foliar-Pak Armament K protects nutrients from adverse interactions in the soil while increasing potassium uptake and efficiency by as much as 30%. Foliar-Pak Armament K is a premium potassium supplement for highly maintained turfgrass. It is formulated with long chain carbon technology specifically designed to deliver potassium to plant roots. Foliar-Pak Armament Concentrate keeps nutrients in suspension, preventing interactions in the spray tank and improving nutrient availability. Armament technology is a patented, biodegradable nutrient enhancer. This high-molecular weight structure holds a large population of negative charges. These negative charges gently complex positively charged metals, keeping them in solution. A revolutionary iron delivery technology driven by polysaccharide chelation. These carbohydrates protect the nutrient and deliver iron to the roots. Once inside the plant, this natural sequestering agent is able to move rapidly throughout the plant to ensure quick delivery of iron to the chloroplasts. Foliar-Pak CSi L is one of the most concentrated liquid silicon products in the market at 25% SiO2 by weight. It is derived from silicic acid, and forms a low molecular weight silica polymer. Foliar-Pak Manganese is specially formulated with plant metabolites that increase nutrient uptake and improve plant health. It contains three natural and modified plant metabolites specifically designed to protect manganese and magnesium. Foundation Forty is a highly concentrated, engineered blend of specific amino acids for increased nitrogen fixation, chlorophyll production, energy production, and the production of anti-stress compounds. Foliar-Pak Talon provides foliar delivery of key nutrients that promote improvement for overall plant health and stress tolerance. Foliar-Pak Talon enhances density, rooting, and recovery. Great for use on transitions and turf establishment. Foliar-Pak Talon targets cell division, chlorophyll formation, increased nutrient mobility and utilization, while improving metabolism of carbohydrates and nitrogen. 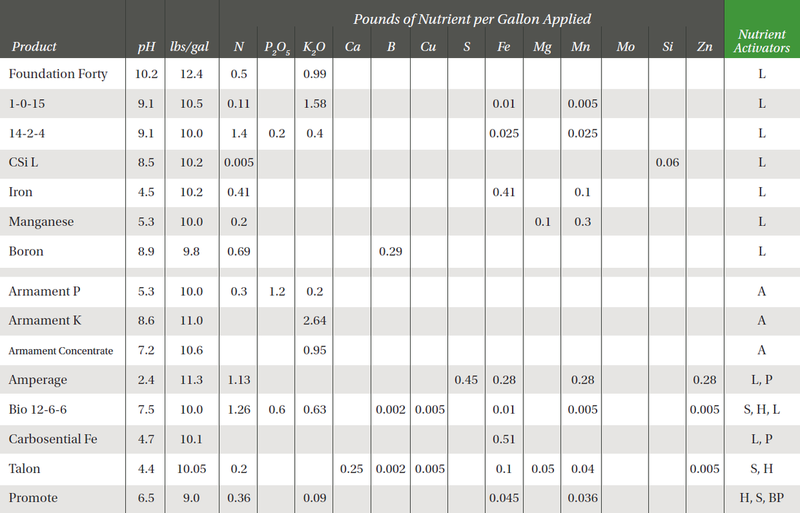 The following chart has been adapted from Foliar Pak's Turf Products Guide. The program guide is available by clicking here. A liquid micronutrient package enhanced with blackstrap molasses. Energy increases chlorophyll production, photosynthesis and plant carbohydrate levels. Energy will provide excellent plant color response due to superior uptake of micronutrients chelated with gluconates. 2 x 2.5 Gal. 9-0-0 12% Ca Zeta Plex provides safe, reliable nutrients enhanced with patented amino technology and our plant derived L-amino acid package. 9-0-0 increases nutrient uptake, nutrient transport and improves plant tolerance of environmental stress. N-Fuze is formulated with a premium L-Amino Acid package which improves overall plant performance and increases uptake of tank mix products. It promotes acidification of root zone when used over extended periods and is a perfect nitrogen source for spoon feeding programs. Redi-Cal is a true organically complexed liquid calcium compound that provides uniform availability of soluble calcium throughout the growing media. By cationic exchange, this soluble calcium that Redi-Cal makes available, replaces the hydrogen ion of the soil colloid. 2 x 2.5 Gal. Assure is a unique blend of nutrients useful for many situations. The high phosphorus formulation is suitable for grow-ins, recovery, sod establishment and where P deficiencies are a problem. 2 x 2.5 Gal. Foliar Relief 3-7-18 is developed to provide maximum plant response during periods of drought, heat and disease pressure. It contains multiple forms of phosphorus, high concentration of potassium and key micronutrients necessary for turfgrass to thrive during summer stress. Protects nutrients from adverse interactions in the soil, which render them unavailable. Proprietary carbon compounds deliver K and Mg safely to the plant rhizosphere. Can be tank mixed with wetting agents and other soil applied nutrients. © Copyright 2019 Rem Web Solutions. All Rights Reserved. Web Design and Content Management by REM Web Solutions.